Metallica is known for pulling out various covers on the road, and it’s become a tradition for guitarist Kirk Hammett and bass player Rob Trujillo to put their own metal spin on some classics. As the tradition goes, towards the middle of the concert, the two usually jam together and serve up a fun cover track dedicated to the city in which they are performing or another special happening. While on tour in Kansas City, Missouri, this week, the guys covered the Pink Floyd track “Run Like Hell” in honor of David Gilmour’s 73rd birthday. Also this week, the duo performed a special version of the Kansas hit “Carry on Wayward Son” while on tour in Wichita, Kansas, dedicated to, of course, Kansas. Watch clips from both performances below. 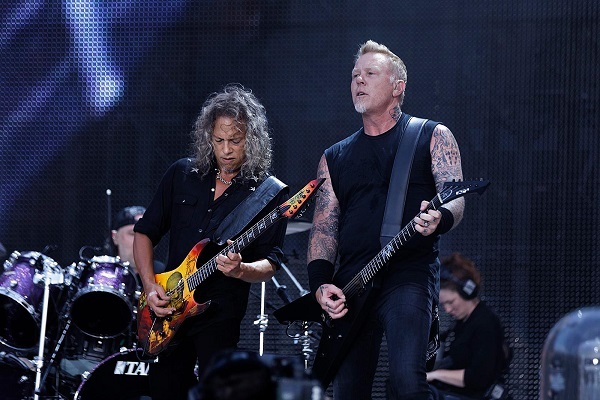 Metallica’s tour will wrap up March 13 at the Van Andel Arena in Grand Rapids, Michigan. In other news, Metallica recently announced that their WorldWired tour will venture into Australia and New Zealand this fall. That tour, which will mark Metallica’s first time headlining stadiums in the countries, will kick off Oct. 17 in Perth and feature support from Slipknot. Corey Taylor and the Slipknot crew will release their as-yet-untitled new album on Aug. 9. Tickets for the overseas shows will go on sale to the general public starting Monday, March 18, at 2 p.m. local time. Members of Metallica’s Fifth Member fan club will be able to snag pre-sale tickets starting Tuesday, March 12, at 1 p.m. local time. For details, head to Metallica.com.